Complete Valve Cover Assembly for 2007+ R55 R56 R57 R58 R59 MINI Cooper S with N14 engine. If you have a leaking valve cover or leaking crankcase vent this is the complete valve cover assembly you need to replace. We've also seen some of these plastic valve covers melt and need to be replaced. The vacuum leaks caused by a leaking valve cover can cause many different check engine lights, limp mode, or just rough running conditions with oil leaks. 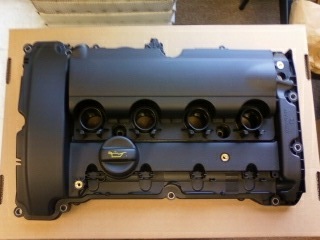 Valve Cover comes complete as shown in pic with oil cap, valve cover gasket, and gasket around spark plug holes.